It's actually more of a reset. David Finch's infamous JL1 variant cover, which was also used as one of the covers for the Program Guide at Fan Expo Canada last weekend..
Tonight at midnight in some select stores and tomorrow morning everywhere else, DC Comics will be getting a lot of attention. Why? It’s the end of one era and the begging of a new direction. 2) Justice League #1 by the powerhouse dynamic duo of Geoff Johns and Jim Lee, which starts off with a six part story that looks at the formation of the Justice League some nebulous “five years ago”. 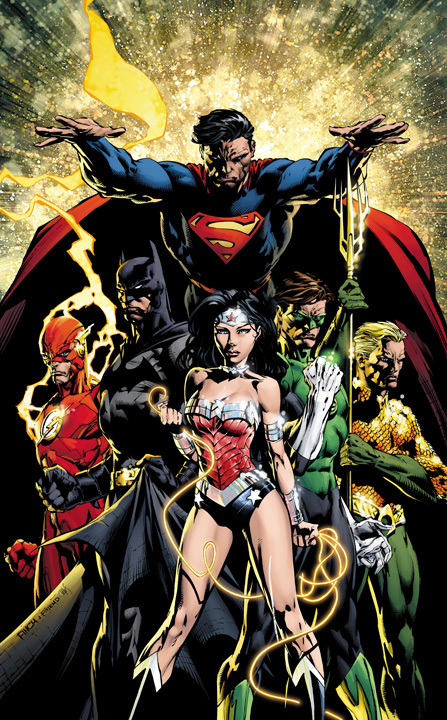 Justice League #1 debuts with a variant cover by David Finch, and there will also be a bagged version that includes a code for a digital copy of the comic. Customers will also be able to purchase the comic online as it is the first of the new “day and date” digital publishing plan that DC has adopted. Needless to say, curiousity levels will be high. Since the story broke DC has been playing up and playing down the changes so much that the existing customer base is as put off by it as they are intrigued, but both groups will want to know the hows, whats and whys of the changes before making a final call on this massive change. At FanExpo this past weekend I had a chance to talk to some of the folks at DC and they are very excited but equally nervous as this is a bold step for the company, and it’s one they won’t know the results of for sure until the third issues of the “new 52” are out and retailers report on whether the influx of interest in the new #1’s has encouraged anyone to stick around long enough to sample the second and third issues. I also spoke with many retailers over the weekend, and they are both excited at the interest their customers are showing in the relaunch, but equally concerned about the longevity of their customer’s interest. On top of that, most seem either negative or indifferent towards the digital releases. Either way, there’s no debate about the importance of this event to both retailers, the publisher and the one element rarely mentioned — the distributor. If DC successfully alienates their existing readers and fails to attract new ones this will end up being a spectacular failure of “New Universe” proportions and could result in a hasty “quick fix” event to restore things to the way they were and it could potentially. If it is successful retailers will see an influx of new and old faces into their stores looking for comics again. Let’s hope that is the case! This entry was posted in Op/Ed, Publishers, Retailers by Kevin A. Boyd. Bookmark the permalink.